How Was It? Us was easily my most anticipated film in the first quarter of 2019 as I couldn’t wait to see what Jordan Peele had in store after shocking the world with his superb Get Out in 2017. Plus, the trailer for this one was awesome. I very much enjoyed my first viewing of Us, but for a horror movie there’s a lot going on and the ending was a bit of a head scratcher, so I left the theater unsure of how I really felt about it. I thought it was probably good, but I was a little confused. So I saw it again. And I still very much enjoyed watching it. I guess that means Jordan Peele did it again, if not quite on the elite level that he achieved with Get Out. The 94% rating on RottenTomatoes and the hyperbole of some critic calling Us “the greatest horror movie of all-time” is a bit misleading, but I definitely thought there was a lot to like here. Peele certainly knows how to craft a horror movie. He’s quite good at creating a tense atmosphere while blending in plenty of laughs without ruining the mood. I didn’t think Us was particularly scary, but it is plenty creepy and the story is far more layered than your typical film in the genre. It’s a movie where every detail is worth noting and warrants multiple viewings. Us is a difficult movie to discuss without getting too spoilery. I can say that I thought Lupita Nyong’o is extremely good in this movie. Of course, any movie that allows an actor to play multiple roles (or versions of their character) is an opportunity to showcase their acting chops and Nyong’o certainly rises to the occasion. She has been good in everything I’ve seen from her so far. I also really enjoyed the daughter in the movie, especially in doppleganger form. Winston Duke is enjoyable too, but mostly for his comic relief. 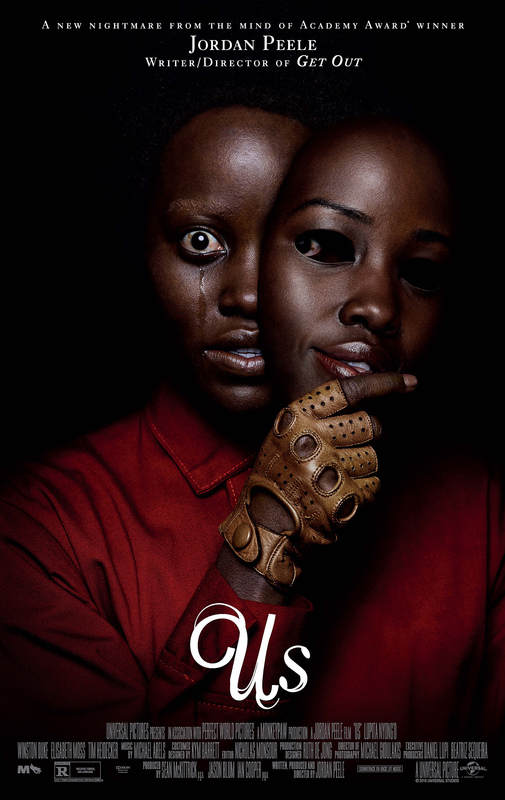 Us is another solid film from Jordan Peele and I’m a bit bewildered by some of the mixed reactions from audiences. I was hoping for another near masterpiece as well, but I can’t say I’m too disappointed with what this film is. I liked it a lot – both times I saw it – and I give it a strong recommendation, but it does fall a little bit short of being a must watch movie. Replay Value: A second viewing made me appreciate it more and helped clear up some questions. Sequel Potential: By the time it’s box office run is over, Us should be in the top 3 R-rated horror movies of all-time so… plenty of potential for a sequel, but Jordan Peele strikes me as the kind of guy that wants to do different things. Oscar Potential: It’s hard to say. Us has been so well received by critics, that it certainly seems possible to get some Oscar attention. I’ll wager on the no though. This is not as good as Get Out, so I don’t see a Best Pic nom come next year. Lupita Nyong’o and Florence Pugh (in Fighting With My Family) have given the best performances of the year so far, but there’s a lot of time and movies to come. Let’s call her a long shot for now. Us gets strong grades in the Score, Sound, and Editing categories as well. Thoughts: What a huge movie. An absolute colossal success and a groundbreaking film in terms of showing that an almost entirely black cast can produce monster box office numbers. Ugh. I hate typing that sentence. I shouldn’t have to. But one can’t ignore the fact that this sort of opportunity has been sorely lacking in the past and Black Panther will surely open doors and possibly knock them completely off the hinges. Ryan Coogler and his team really did a wonderful job creating this film. The fictional nation of Wakanda is stunning and fully realized and does as much for empowering women as it does for black people. In Wakanda, women are the fiercest warriors and protectors of the realm, and T’Challa’s sister is the head engineer in advanced weaponry and gadgetry. There’s been some buzz in the industry the last few years about casting a black James Bond, and Black Panther has a lot of 007 in it. The main conflict in the film is that Michael B. Jordan’s Erik Killmonger believes that he has a claim to the throne in Wakanda and challenges T’Challa. Killmonger’s motives and backstory provide some conflict in the viewers as he’s a rare villain that you can possibly sympathize with. The cast in this movie does a brilliant job, with Jordan being the highlight and Lupita Nyong’o and Letitia Wright also giving strong and fun performances. Black Panther is a film that fires on all cylinders and provides a thoroughly entertaining film experience. It’s definitely a crowd-pleaser. I had a blast watching it and I hope it’s just as much fun over multiple viewings. 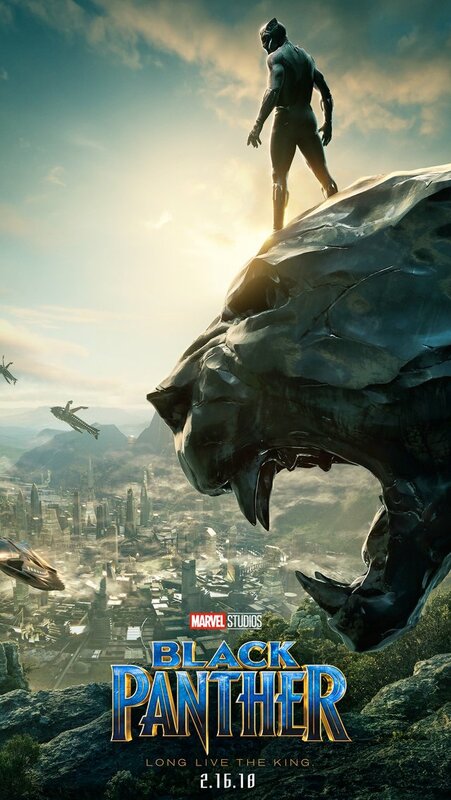 I can confidently say Black Panther ranks in the upper echelon in the Marvel Cinematic Universe – possibly as high as #1 – and the presentation of Wakanda and the film’s groundbreaking nature make it a must see in my book. Replay Value: If I didn’t have so many other movies to watch before the Oscars, I would have seen this again by now. I’m looking forward to a second viewing and I suspect it will hold up pretty well. It is a film I will want to own. Sequel Potential: The film’s success will certainly fast-track a sequel. I wouldn’t be surprised to see it released in 2020. T’Challa should be playing a significant role in the upcoming Avengers: Infinity War films. Oscar Potential: I called multiple nominations for Get Out at this time last year and I was right on most of them. I feel less confident in Black Panther‘s chances. This film’s strongest cases are probably in the Production Design, Costumes, Visual Effects, and Sound departments. Michael B. Jordan has already got some Supporting Actor buzz, but he probably won’t get a nomination. *Dina Meter: My wife would have enjoyed this movie. *I’m adding a new element to my movie reviews. I don’t expect everyone to have the same taste as me. Someone asked what my favorite movies of 2017 were and my first response was The Shape of Water and the person I was talking to said he hated it. My friend I saw it with didn’t like it much either. I feel like my wife is a pretty good measure of what a casual filmgoer will like or not like. She tends to not enjoy the more obscure films that I like. With that in mind, I’m implementing the Dina Meter, where I will sum up what she thought about a movie or what I think she would have thought if we didn’t watch it together. Bottom Line: Without a doubt, Keegan-Michael Key and Jordan Peele’s sketch comedy show “Key and Peele” has been one of the funniest things I’ve seen on television in recent years. The duo has since moved on with their careers, with Key starring in last year’s very good but largely overlooked film Don’t Think Twice and becoming a very popular voice actor, while Peele wrote last year’s Keanu as the first film for the two comics to star in together, but received rather lukewarm reviews. 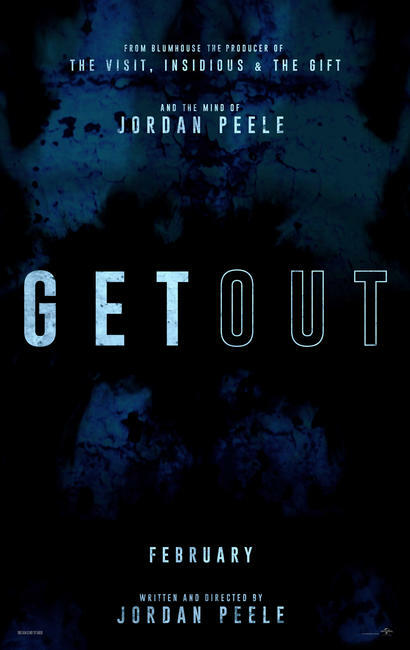 And then came the trailer for Get Out, a horror film written and directed by Jordan Peele that looked like a total mind bender, full of racial tension – a complete departure from what the comedian is famous for. And yes, Get Out was completely crazy, but it’s a game changer. It tells the story of Chris Washington (Kaluuya), a black man going to meet his white girlfriend’s family for the first time, along with all the trepidation and seemingly harmless stereotypes that arise in such a situation, made all the more awkward when Chris sees that the family employs a couple of black folks as servants around the house – and they are about as natural as Keanu Reeves in a dramatic role. Get Out manages to turn a situation that could make any man apprehensive – meeting the girlfriend’s parents – and turns it into a complete horror story, filled with racial overtones that are still way too relevant in today’s world. Get Out is a borderline masterpiece that is wicked smart, excruciatingly tense and entertaining, all while sprinkling in appropriate amounts of humor and traditional jump scares. It’s a monumental achievement for Jordan Peele in his first directing role and almost certainly makes the multi-talented comic an A-Lister going forward. His script is full of bits of racism and stereotypes that make the film’s wild final act all the more mind-blowing and powerful. The acting in Get Out is top notch from the entire cast. Kaluuya easily carries the film in the lead role, providing Chris with a perfect mix of cockiness and apprehension, as his vulnerability increases throughout his horrific experience. Bradley Whitford and Catherine Keener are genuinely creepy as the parents, with Keener’s hypnotherapy likely to disturbingly cling to you long after the film is over. And then there’s Lakeith Stanfield and LilRel Howery, who play small but spectacular roles. Stanfield is particularly great, channeling his hilarious character from the hit FX show “Atlanta” in Get Out‘s opening scene before reappearing later in a completely different context. It’s the kind of glorious bit role that has earned a number of actors Best Supporting nominations in the past. Get Out is the first must see film of 2017 and is better than any movie that I saw in 2016. It will be interesting to see how a horror/thriller hybrid released in late February and written/directed by a black man will fare come next year’s award season. Sadly, this genius film will likely overlooked or forgotten by then, but with a ridiculous 99% positive rating from the critics so far, maybe Jordan Peele’s wonderful film will help break new ground. And if it does get nominated, it shouldn’t be to diversify the awards, it should be because it deserves to be – and Get Out is plenty worthy. Replay Value: This is the kind of film that requires a second viewing. Sequel Potential: Even though this is likely to be a big hit and has award potential, a sequel would almost certainly trivialize this film’s message. Oscar Potential: If Get Out doesn’t get a Best Picture nomination it will be because it got slighted or because 2017 was an amazing year for films. This movie is drawing live at Best Pic, Best Director, and Best Original Screenplay noms, with some serious long shot possibilities for Kaluuya, Keener, and Stanfield in the acting categories. Still, we are in pretty unprecedented territory here.